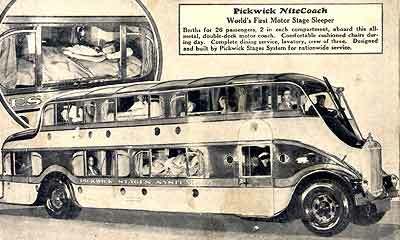 “The final and highest plane of motor bus construction has been reached as the Pickwick Stages System presents the "Nitecoach," with comfortable sleeping quarters for 26 people. “This spectacular car, with its 13 compartments, complete dining service, lavatory and many other unusual features has just been exhibited for the first time at the Pacific Southwest Exposition at Long Beach, California, and is providing one of the biggest attractions at this world showplace. “Twenty-thousand people crowded the court in which the car was christened by Clara Bow, vivacious screen star, and every day since this event, an average of 3,500 people have passed through the unusual coach. “The spectacular ‘Nitecoach’ looks like nothing else awheel or afloat. At first glance it appears to visitors like a gleaming blue and gray submarine on bulging balloon tires, for it is gracefully streamlined and is equipped with portholes as well as big observation windows. There is no hood as on the ordinary stage, the portion of the body containing the driver’s compartment being built directly over the motor. From tapered prow to rear observation deck, the Nitecoach is as graceful as a yacht. “But the big surprise is to find that this compact vehicle, no larger than other deluxe cars, has sleeping room for 26 adults, with comfortable sleeping space during the day as well! The entrance is an arched doorway near the front of the car, opening immediately on a compact kitchen which is part of the regular equipment. This section opens into a high-roofed center aisle running the length of the car, on either side of which are ranged the thirteen compartments on the upper and lower deck. “The mystery of where so many passengers can find both seating and sleeping accommodations is cleared up when the car is examined. 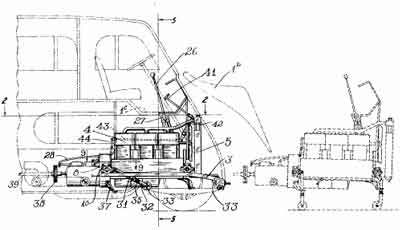 By a most ingenious arrangement, the upper and lower compartments are made to interlock, reducing the height of the car to only a few inches above the ordinary single-deck stage. The center aisle is located halfway between the floors of upper and lower decks, so that it is but a short step down or up to either level. “Head room of center aisle is enough for a giant - seven feet from floor to ceiling - and the aisle is 22 inches wide. Heavy sliding curtains give privacy to each compartment at night. With curtains drawn aside, each compartment is revealed as a little stateroom, with two deep cushioned chairs facing each other and a wide three-paneled window extending its full length. These windows, all moveable, have both shade and draw curtains. “That these compartments are deserving to be called staterooms is shown by the following features: In each there is a built-in thermos jug of ice water and a gleaming nickel wash basin with running water. Two sliding drawers, measuring fourteen by seventeen inches, are for clothing and personal effects. There is space where a suitcase may be stored, making it completely accessible at all times. It is almost impossible, until one has seen the car, to imagine where all this space in each compartment can be. “A white-clad porter demonstrates the most interesting feature of the ‘Nitecoach’ by making up the berths in a compartment. He deftly swings up the back of each seat, which is hinged at the top, until lower ends join, thus forming a single bed 24 inches wide. This makes the upper berth. From under the seats the porter produces a mattress and lays it over the cushioned seat backs, adding linen and blankets to make a snug and inviting bed. The lower berth is just as easily made up. The lower portion of each seat is in two sections, which are arranged along the floor to form a continuous cushion. With the addition of mattress, sheets, blankets and pillow, this also becomes a comfortable bed. The length of each birth is ample, being six feet four inches. While berths are being made up by the porter, passengers find comfortable extra seats at both front and rear of the car. Including the small folding seat in each dressing room, the Nitecoach has a total seating capacity of forty-dour, although twenty-six is considered a full load. “The interlocking feature of compartments allows a private dressing room for each, directly adjoining. This space is six feet four inches high, permitting occupants of the compartment to stand upright while dressing. It is a little over three feet long, and while only 18 inches wide, the berth space gives additional room to make dressing easy. A plate glass mirror above the wash basin is an additional convenience. The dressing room is curtained off from the aisle and is provided with a folding seat. “Five electric lights in each compartment give plenty of illumination. There is one light at the head and one at the foot of each bed, as well as one in the dressing room, all controlled by individual switches. The aisle is also indirectly lighted at night. “Ventilation and heating are given much attention. When berths are made up a night, the wide center windows are locked shut, for safety, but the two smaller windows in each compartment can be opened at the will of the occupants. In addition, there are portholes all around the car, which give perfect ventilation, aided by electric fans. In cold weather fresh fan-circulated warm air is forced through the car. “Steward Prepares, Serves Hot Meals. “In the compact kitchen in the front of the car a steward prepares hot meals on order at any time of the day. They are served on large trays to passengers in their compartments. The chef's culinary equipment is ample, consisting of a sizeable range, refrigerator, coffee percolator, food containers, space for all cooking utensils and tableware. Aisle space at the entrance of the car gives plenty of elbow room in the kitchen while the car is in motion and the door closed. “Lavatory is located at the rear of the car, and is complete in every way. Chemical tanks take care of all the waste until division points are reached on cross-country runs. “The Nitecoach carries a crew of three - a driver, a steward and a porter - assuring prompt service for all needs of passengers. “The construction features of the Nitecoach are next in interest after curiosity about sleeping arrangements has been satisfied. The Nitecoach is different in construction from any previous type of motor stage. The car has no chassis, as the word is generally understood, the frame and body being built as a unit. For additional strength they are riveted together, not bolted. The heavy frame of I-beam steel is seen on the outside of the car, extending clear around as a graceful band and belt line. Passengers on the lower deck are inside this sturdy barrier, practically impregnable to outside shock. “The proportions of the new car are imposing, but do not exceed those of the ordinary large motor stage. The Nitecoach measures thirty-four feet four inches long, ten feet three inches high and eight feet wide. The weight is about 14,000 pounds, actually less than that of some ears now satisfactorily operating on the highways. “New York to San Francisco Boat Carries 25 people. Meals Served, and Sleeping done en route. “The ‘Alsacia’, juggernaut of the highways that at a terrific rate is to eat up the miles and miles of bituminous and concrete ribbon between Hayward and New York city - one of a flock of 45 that are soon to be in operation - arrived in this city this afternoon and for an hour or two stood in front of the Auto Cigar Store and Pickwick stage station and almost bid the Villa hotel. “This is the first ‘Nite coach’ of the Pickwick Stage company, and it was brought here as an advertising stunt incident to the opening of the new Pickwick hotel at Fifth and Mission streets, San Francisco, Saturday night. This is to be a big tent in the metropolis, and there is to be a tremendous program, to which the public is invited. The Pickwick people are now the owners of KTAB which is to be operated from the new hotel, and it is said that 75 loud speakers will be provided for the crowd next Saturday. “The ‘Alsacia’ is a two-deck affair that looks like a combination of battleship, desert armored car, World War tank, and a Pullman sleeper. It is the commercial auto deluxe, is designed to furnish all that the crack railroad flyers furnish, make night trips as comfortable as a palace car, and day rides more comfortable than sitting in a hotel lobby's big leather chair. It is twenty to thirty feet long, as wide as a roadway will stand and give other cars room to pass, and it is provided with every available convenience, night and day for twenty-six passengers. Meals are served en route, there is an observation section - though the whole car is largely glass - lavatory convenience is there, drinking fountain with ice water, the beds look like Pullman offering, and, apparently nothing is lacking - not even the colored porter. The big car rolled in here with a chauffeur, a porter and electrician looking after the big bus, together with three others deadheads, so to speak. “Pickwick Motor Coach Works Ltd., has moved into its new factory at 114th Street and Redondo Boulevard. On March 29, 1929, Pickwick entered the air transportation business by inaugurating an airline service between Los Angeles and San Diego. 10-passenger tri-motored Bach 3-CT-6 Air Yachts were used, making two trips daily. The fare was $9.75 one-way or $19.00 round trip. 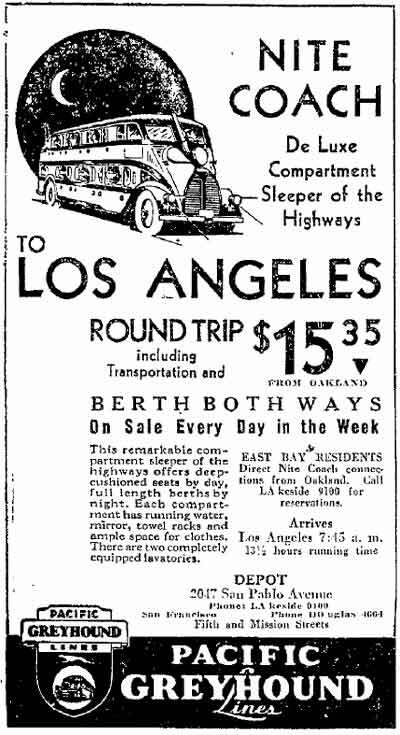 On May 12, 1929, a similar daily service was inaugurated between Los Angeles and San Francisco costing $32.50 one-way and $58.50 round trip. The Bach 3-CT-6 left Glendale's Grand Central Air Terminal at 8:30 a.m. arriving at San Francisco's Mills Field at 11:45 a.m. The plane made the return trip to Los Angeles mid-afternoon, arriving at Grand Central at 6:45 p.m.
“Coach, Plane Combined For Quick Travel. “Los Angeles to Chicago in a day and two nights, with restful sleeping hours aboard the palatial motor sleeper – thrilling daylight hours in a tri-motored Bach Air Yacht. Such is the program outlined by the Pickwick Airways, Incorporated, to be pout into effect as quickly as its fleet of planes can be completed. The first definite announcement of this plan was made by Charles F. Wren, president of the Pickwick stages system, and organizer of the new air company – coincident with the display of the Nite Coach and ten-passenger place at the national Aeronautical exposition, Mines field, Los Angeles. “Operation of the Pickwick airways will begin with twice-daily schedules between San Diego, Los Angles and San Francisco, to be followed immediately by a daily California to Chicago schedule, with direct air connections at Chicago for New York and Atlantic coast cities. The first planes, now under construction, are expected to take the air before the end of the year. While similar combinations of cross-continent air-and-land travel have been projected, the Pickwick organization has taken the first definite steps toward it realization, with a large fleet of air cruisers ordered and being built by the Bach Aircraft company of Venice. “The tentative route from Pacific to Atlantic, as outlined by President Wren, is as follows: starting from Los Angeles in the evening, travelers will find restful sleep in compartments of the 26 passenger Pickwick Nite Coach, awakening the following morning at the aviation field of Phoenix, Arizona. A few minutes later one or more huge passenger planes will soar from the field and head into the east, making passenger stops at El Paso, Dallas, Tulsa, Springfield and Kansas City, with the first day’s destination set at St Louis. The air trip from Phoenix to St Louis will take about 14 hours, and will be made in full daylight, revealing the colorful mountains and plains of the southwest and Midwest for more than 1500 miles. “At St. Louis the trip will be resumed by Nite Coach to Chicago, arriving in the early morning hours, with passengers rested and ready for a business day – or a further short hop to New York by co-operating air lines. “It is pointed out that only one business day will be lost in the trip to Chicago, and that if the journey is commenced on a Saturday evening, no business hours are sacrificed. “At San Francisco, planes of the Pickwick Airways will make direct connections with those of the West Coast Air Transport company, which has created one of America’s outstanding records of success and safety in passenger transportation. Using the same type plane ordered by the Pickwick Airways, the West Coast Air Company has maintained regular services between San Francisco, Portland and Seattle, carrying capacity loads. A notable featured in the record of this company is that several of its planes have had 900 flying hours each – an equivalent of 90,000 miles, or more that three times around the globe – and that they show no sign of wear or weakening after covering this immense distance. “The Bach air yachts to be used by the Pickwick Airways are powered with Pratt & Whitney ‘Hornet’ motors, developing as much as 600 horsepower. They recently acquired fame through Art Goebel’s amazing non-stop flight across the continent, which lowered all previous records by several hours. Goebel’s engine was of the ‘Wasp’ type. “There are three of these motors – any two of which, or the center one alone being capable of sustaining the ten-passenger plane in continuous flight, while a long and safe gliding range is possible with all motors quiet. Two pilots on duty at all times, a complete set of duplicated controls, the absence of all exposed wired, and many other features combine to make these air cruisers as safe as human ingenuity can devise. A safety factor that also adds greatly to passenger comfort is the system of hydraulic shock absorbers in the landing gear, which permits smooth landing and take-off at all times. “Great speed is possible with the Bach planes – 170 miles per hour or more- but the flying speed will be closer to 110 or 120 miles per hours, leaving a valuable reserve for emergency. Strength, scientific speed lines, and safety features have won these planes high praise and the recommendation of national air bodies for use in interstate flying. 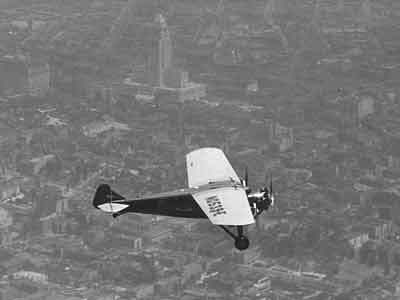 On July 29, 1929, an additional Pickwick Airways service was initiated between Los Angeles and Mexico City, and Mexico City, Mexico to Guatemala City, Guatemala, a route formerly operated by the Latin-American Air Transport Co. of Mexico City. To help publicize the new service, the Pickwick Latin American Airways hired female aviatrix Pancho Barnes (Mrs. Florence Lowe Barnes) to fly from Los Angeles to Mexico City in February of 1930. On the five-day round trip Pancho stopped in Tucson and Nogales, Arizona and Los Mochis, Mazatlan and Guadalajara, Mexico. Accompanying her as navigator and interpreter was Marino Samaniego, movie star Ramon Novarro's brother. Pancho successfully reached Mexico City and was awarded an honorary Mexican pilot's license. Coincidentally, another female pilot named Mildred Morgan had completed a similar journey two weeks earlier. During 1930 and 1931 Morgan was sometimes employed by Radio Station KTM, Pickwick Broadcasting's Santa Monica radio station and the two womens' flights may have been part of a larger publicity stunt that remains as yet undiscovered. 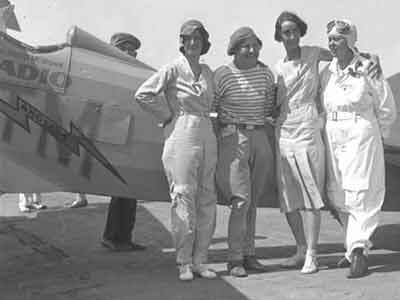 However, the aviatrix' flights were of historical importance as both claimed to be the first female pilot to fly from Los Angles to Mexico City. With the arrival of the Depression and the failure by the company to land a U.S. mail contract, Pickwick Latin American Airways went out of business later that spring as did the related Pickwick Airways. In 1930 Pickwick-Greyhound opened a $600,000 six-story hotel/terminal in Salt Lake City which was followed by a colossal $3,500,000 hotel and bus terminal in Kansas City, Missouri. In June 1929 the Pickwick Corporation entered into a merger agreement with the Minnesota-based Northland Transportation Company (aka Greyhound) forming a cohesive transportation system that covered the Western half on the United States, all the way from the Pacific Coast to the Mississippi River. Pacific Greyhound Lines, Inc. was organized under the laws of California on April 12, 1930, as a consolidation of the following motor bus lines: California Transit Company (aka Yelloway), Pickwick Stage System, southern Pacific Motor Transport Co., Oregon Stages, Inc., Peninsula Rapid Transit Co., Pacific Auto Stages, Golden Gate Stages, Calistoga & Clear Lake Stage Co., Pacific Coast Motor Coach Co., Kern County Transportation Corp., Coast Auto Lines, Inc., Sierra Nevada Stages, Pacific Stages Inc., and Boyd Stage Line. Officers – T.B. Wilson, Pres. ; C.E. Wickman, W.E. Travis, C.R. Harding, R.W. Lemen, H.C. Lucas, Vice-Pres. ; M. McKinstry, Sec. and Treas. ; F.W. Ackerman, Aud. ; L.D. Jones, Gen Mgr. Directors — W.G. Filer, C.R. Harding, L.C. Gilman, W.E. Travis, G.W. Traer, Jr., F.W. Webster, C.E. Wickman, T.B. Wilson, C.F. Wren. Head Office — 9 Main St., San Francisco. Greyhound’s Western States operation was eventually divided into 3 companies, Pacific Greyhound Lines, Pickwick-Greyhound Lines Inc., and Southland Greyhound Lines, Inc.
Wren’s Pickwick Corporation held major interests in both the Pickwick-Greyhound and Pacific Greyhound Lines. The merged operations represented a rolling stock of 1,400 buses, which covered a total of 190,000 miles of highway each day. Greyhound covered 28,000 miles of Western U.S. highway, carrying 10,000,000 passengers annually resulting in a total of 73,000,000 bus miles per year. “Isleta, N. M., April 11, 1930— (A.P. )— A fast Santa Fe mail train today crushed a Pickwick Greyhound motor stage, killing 19 persons, 18 passengers on the bus, and the driver. “The accident was the worst in the history of Western bus transportation. The train sideswiped the stage as the driver tried frantically to swing it clear of the oncoming locomotive and the terrific impact so mangled the bodies of the victims that late today identification of three had not been made. Eight persons were injured seriously. “Demolished by the collision, the bus was ignited by flames which licked over it from the gasoline tank and the bodies of the victims were robbed of clothing by the fire which, in some instances charred the flesh itself. Two bodies and parts of the bus were carried half a mile by the speeding train. “Neither the Pickwick Greyhound office at Los Angeles, from which the bus departed at 11:59 p. m., Wednesday, Eastbound for Denver, nor the bus driver carried identification for the passengers. The names of the victims were obtained from bits of personal effects which escaped the ravages of the flames. “The engineer of the train, C.C. Davis, said when he realized the crash was unavoidable, he clapped on the - brakes and had slowed down to 38 miles an hour when his locomotive struck the stage. The train was partly derailed. Tourists and Indians from the near-by pueblo were the first to arrive on the scene. Ambulances arrived from Albuquerque and other nearby communities a half hour after the crash. 2 passengers died soon after the crash bringing the death total to 21. Crash investigators discovered that a woman passenger was sitting on F.D. Williams’ lap at the time of the crash. Although the crash did not involve a Nite Coach, the publicity reflected poorly on Pickwick's Los Angeles operations. In early 1930 Austin debuted the 53-passenger Pickwick Duplex Day Coach, which was largely an improved version of his 1928 Nite Coach Sleeper designed for standard intercity service. Historically the forerunner of General Motors' Scenicruiser, the Duplex was of semi-monocoque steel and Duralumin construction. 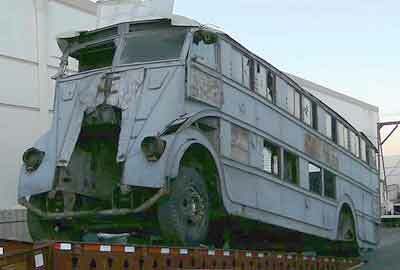 According to Autobody the principal structural members were 7-inch steel channels which extended along the lower outside edge of the coach tied together by 14 cross members of 4-inch seamless steel tubing forming a foundation to which the body framing and chassis were affixed. The heavy outside channels along the vehicles circumference also served as a guard rail, protecting the occupants of the coach from intrusion in the case of a collision. Three additional steel and Duralumin channels ran along the entire length of the coach providing the upper and lower framework of the passenger windows which were fitted between pressed steel uprights that connected the 7-in. steel channel with the Duralumin upper framework. The vehicle's exterior was made up of double-walled Duralumin panels filled with Thermosote, a tar-impregnated wood fibre insulation. 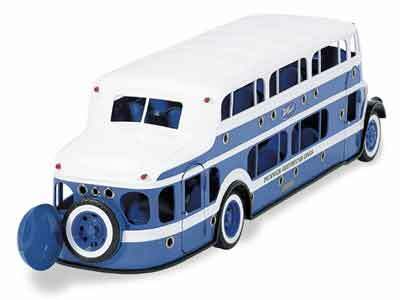 The coach has a central aisle intermediate the two decks; single steps lead up and down into the 4-place compartments. Headroom over the center aisle was 85 inches except over the baggage compartment where it was reduced to 72 inches. The roof was composed of a central Duralumin backbone and framework covered by insulating board and a heavy nitrite-coated canvas cover. As on the Nite Coach, the Duplex' front-mounted engine was built into a removable carrier frame which was fitted with either a Sterling Petrel or Hall-Scott 6-cylinder gasoline engines of between 150 and 175 h.p. Equipped with powerful air brakes, power was delivered to the rear wheels via a driveshaft that rode inside a 20 inch wide central isle which was made up of heavy 1/8 inch Duralumin plate. From the center aisle, steel uprights ran up to the roof forming a central framework to which the various compartment partitions and braces were attached. 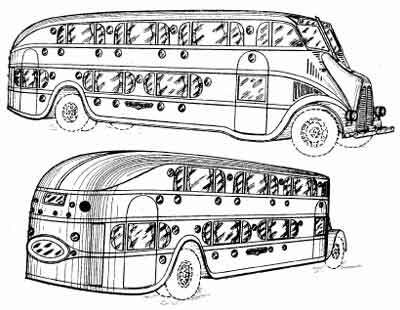 The resulting steel and Duralumin honeycomb resulted in a durable two story coach weighing little more than a standard single deck 33-passenger coach. The windows were made from shatterproof glass framed by composite Duralumin and Bakelite frames. It is believed that a total of 40 Duplex coaches were built by Pickwick between 1930 and 1932. Eleven Duplex coaches were delivered to Pickwick-Greyhound’s Missouri operation in June and July of 1930, five with Sterling engines and six with Hall-Scott power. Three were assigned to the Denver-Salt Lake City run while the remaining eight saw service on the Kansas City-St. Louis route. In October, 1930 Pickwick-Greyhound’s Missouri Duplex coach operation came to an abrupt end when the state DOT outlawed oversized/overweight vehicles on the states roadways and the Duplexes were subsequently replaced by standard-sized Yellow Coaches. Pennsylvania Greyhound is also supposed to have used a few Duplex Day Coaches on its New York-Washington run. “The first Pickwick 53-passenger Duplex day coach has been placed in service between San Francisco and San Jose, Calif. This new double-deck, intercity coach is the latest brain-child of Dwight E. Austin, designer of the famous Pickwick Nite coach and of other models embodying radical departure from conventional motorcoach construction. Austin not only designed the Duplex coach but is general manager of the new Pickwick Motor Coach Works at El Segundo, Calif., in which it was built. He came to the Pickwick organization in 1923 as designer and superintendent of the body department. He was only 26 years of age at this time, without a college degree but chock full of practical experience obtained in the repair-shop and body-building operations in which he had been engaged with his father and brother. The Pickwick management liked his work and liked his ideas, and it had the operating experience and the facilities for trying out Austin’s suggestions for new vehicles. “In the summer of 1925, Pickwick System put into service his first parlor-buffet coach. 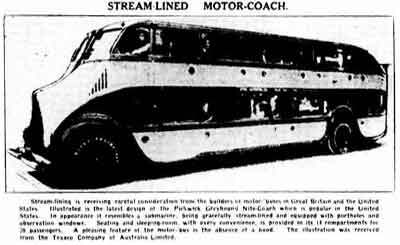 In March 1927 his observation-buffet coach with upper deck seats was built and four months later, his improved model with elevated driving seat. The following year came the Nite coach, the most radical of his constructions – an all-metal double-deck sleeping coach with elevated driving compartment and a power plant capable of being rolled out at the front and replaced with a fresh unit, in 20 min. The success of this model on the Pickwick lines immediately suggested a day coach built along similar lines. 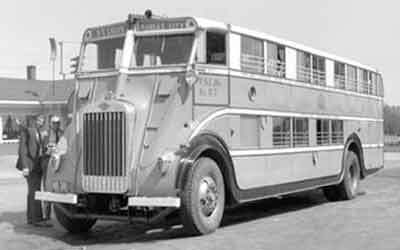 The result was the 53-passenger Duplex coach illustrated on the opposite page, and the Pickwick Motor Coach Works at El Segundo, especially built for the production of these all-metal, double-deck sleeping and day coaches. This is the largest plant of its kind in the West and one that is destined to be of great importance, because of its affiliation with one of the world’s largest operators of motorcoaches. “Non-shattering glass throughout and air brakes are among the safety features incorporated in this construction. In building the Duplex coach, the designer had in mind three principal aims : long life, ease of service and safety. “At 33; head of the coach-building works of one of the world’s largest operators of motorcoaches; designer of Pickwick’s Duplex day coach (1930); designer of Pickwick’s Nite coach (1928); designer of Pickwick's Observation-Buffet coach (1927); designer of Pickwick’s Parlor-Buffet coach (1925) and preceding types of single-deck intercity coaches. “His Career is a striking example of high achievement in the face of adverse circumstances. His day schooling ended at the eighth grade, but he continued to study on his own. In 1915, he joined his father and brother in setting up an automobile-repair shop; they branched out later into body building; selling the business in 1922. The following year he became associated with Pickwick as designer and superintendent of the body department. 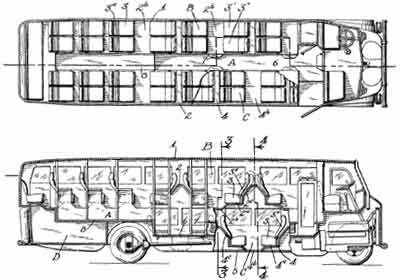 Now, vice-president and general manager, Pickwick Motor Coach Works, El Segundo, Calif.
“The general overall dimensions of the Duplex coach are as follows: Length, 32 ft.; height, 9 ft. 10 in. ; width, 10 ft.; road clearance, in center between front and rear axles, 16 in. The weight of the coach unloaded is 17,000 lb. and the passenger load is estimated at 8,000 lb., or a total of 25,000 pounds. “Like the Nite coach, the Duplex is an all-metal construction in which chassis and body have been combined. The principal structural members are 7-in. steel channels which extend along the lower outside edge of the coach. These are tied together by 14 various cross members and form a foundation to receive the body construction and chassis units. These heavy channels on the outside of the structure also form an extremely solid guard rail to protect the coach from accidents. Three additional channels of steel and Duralumin run the entire length of the coach above and below the windows. The uprights are of pressed steel, connected at the bottom to the 7-in. channel and at the top to Duralumin carlines. The inside and outside sheathing of the structure is of Duralumin, insulation being placed between this double-sheet wall. The central isle, 20 in. wide, is built above the lower floor level and is made of a 1/8-in. Duralumin plate running from the motor compartment to the rear-wheel housing. The headroom over the aisle is 85 in. except over the baggage compartment where it is 72 in. The drive shaft and other mechanical equipment going to the rear axle are carried under this aisle. From the aisle, uprights are carried at intervals connecting with the roof. These with the compartment partitions and braces make a type of honeycomb construction that is exceptional for its rigidity. “The baggage compartment behind the rear axle provides 284 cu. ft. of storage space, accessible from either side through doors 30 in. high and 40 in. wide. This affords storage space for two large suitcases per passenger, also for several trunks. The floor of this compartment being only 20 in. from the ground, heavy trunks can be loaded single-handed. “Two large dome lamps light the center aisle whose single steps lead up or down to the passenger compartments which are lit by 12 c.p. receptacles placed above each seat and controlled by individual switches. All lights can be controlled from a master switch in the driver’s compartment. “Seats are individual reclining chairs with the exception of five on the rear lounge, two observation seats in the driving compartment and two folding seats in the vestibule. The floor of this compartment is well insulated to prevent heating from the motor and there is a large- ventilator on each side of the front panel. There are only 18 seats on the lower level, leaving 35 of the choice upper-deck seats. Previous experience in operating these observation types of coaches has proved these seats to be most desirable from the passenger’s viewpoint it is said. “Another feature of the general arrangement is that only 16 seats face the rear. The remaining 37 passengers face in the direction in which the car is traveling. The individual reclining seats are of Pickwick design and construction. They are constructed chiefly of Duralumin, are quiet in operation and are deeply upholstered in mohair. A mohair trimmed armrest is also provided for the aisle-seat passenger. “Two Pickwick Duplex day coaches, with a capacity of more than 60 passengers, are being operated thru Greeley twice daily on the Denver-Salt Lake City run. The Duplex out of Denver arrives at 9:20 a. m., while the one from Salt Lake City is due here at 9:40 a. m.
“These busses are by far the largest on regular schedule here. They have two decks of seats. The driver sits on the upper deck level high above the huge 176-horsepower Sterling motor with which the machine is equipped. “The main aisle of the bus is above the floor of the lower deck. Passengers step down to the lower deck and up to the upper deck. The elevator aisle is to permit the propeller shaft of the bus to clear the body. “Aluminum alloys used in the Pickwick Duplex day coach make it as light in weight as the huge single deckers operated thru Greeley. Toilet facilities are provided in the Duplex. “The astounding growth of the motor coach industry during the last decade has brought about revolutionary changes in design and construction of passenger coaches. The long-haul passenger business, in which the motorcoach has become a recognized factor in late years, inspired the development of special types of buses capable of meeting the exacting requirements of this sort of travel. In these coaches, wood has given way to metal, and mohair has in many instances replaced leather for seating upholstering. Refinements have been added in the form of forced-draft heating and ventilating systems, Thermos drinking fountains, individual reading lights, and in some instances, lavatories and even facilities for sleeping and dining. “Outstanding among the leaders in the field of motor- coach operation and construction in this country is the Pickwick Corporation. It was one of the pioneers in development of this industry. Although concerned chiefly with the operation of motorcoaches, Pickwick has engaged in coach construction and designing almost since the inception of the company 18 years ago. Until about two years ago Pickwick confined its coach-building activities to construction of rolling stock for use on its own lines. 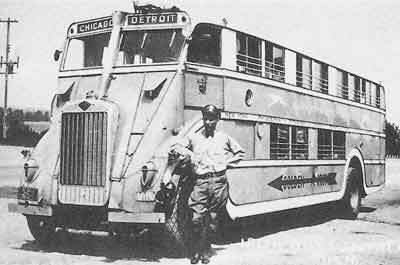 In this, the company was eminently successful, due to the experience of Charles F. Wren, its president, as a practical bus operator, and to the genius of Pickwick’s brilliant young designer and engineer, Dwight E. Austin. Although lacking the facilities for turning out more than a small portion of the rolling stock required by its constantly expanding system, the Pickwick company achieved prominence in the couch-building field from its special-type buses, notable among the first of which were the parlor-buffet and observation-buffet coaches, equipped with dining facilities. “Pickwick Duplex Coach and the 53 passengers for whom this coach provides seating accommodation. All have individual reclining chairs, with the exception of five passengers on the rear lounge, two passengers seated in the driver’s compartment, and two folding seats in the vestibule. Only 16 seats face the rear; 35 passengers can be seated on the upper level, which is generally preferred by the passengers. “The practicability of the Nite coach and its success financially and from an operating standpoint have been conclusively proved, Pickwick officials state, in more than a year’s continuous service between Los Angeles and San Francisco, and more recently between Kansas City and St. Louis. “Hardly had Wren and Austin perfected their Nite coach when they set to work on another model, designed for travel only and for a carrying capacity of 53 nearly double that of ordinary-type motorcoach. 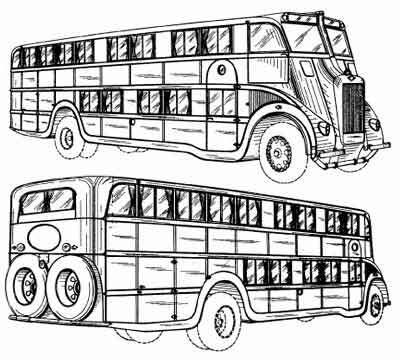 Applying the same double-deck, staggered-compartment plan to the new day coach, Pickwick produced early this year its first Duplex coach, constructed entirely of metal like the Nite coach and having mohair-upholstered reclining seats, removable engine, also like the Nite coach, lavatory, portable tables for lunching or card playing, interior luggage compartment, hot-air heating and forced-draft ventilating systems. “Operators everywhere have been quick to sense the tremendous advantages offered by a coach of nearly twice the ordinary carrying capacity and weighing no more and costing nor more to operated than many of the 33-passenger models. The first Pickwick Duplex was introduced during May of this year. “Charles F. Wren – President of Pickwick Corporation and its subsidiaries. He was one of the earliest of the long-distance motorcoach operators. 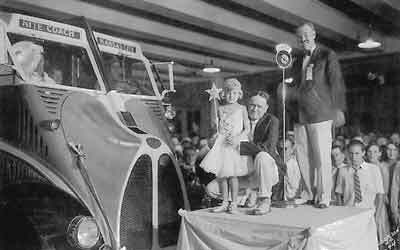 “Dwight E. Austin – Vice-president and general manager of Pickwick Motor Coach Works and designer of the novel Pickwick Note coach and Duplex day coach. Austin not only designed the Duplex coach but is general manager of the new firm." When Pickwick Motor Coach Works entered into bankruptcy in 1932, its principal owner, Charles F. Wren (b.1885-d.1944), created a new firm in order to refurbish and manufacture buses for the Columbia Pacific Nite Coach Lines Inc.. a recently organized Wren-backed firm that operated a Los Angles to Chicago passenger line which stopped off in Salt Lake City, Utah. 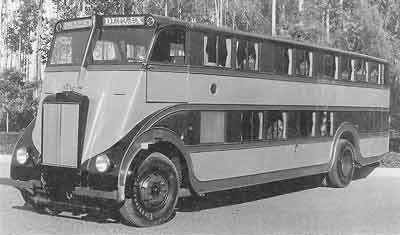 Just before Pickwick Motor Coach Works Ltd. went out of business, Wren had introduced an all-new rounded Nite Coach that debuted in late 1932 featuring Dwight E. Austin's patented angle drive mechanism and a transverse rear-mounted Waukesha engine. Although the exact circumstances remain cloudy, it appears that Austin and Wren parted ways at the end of 1932, just as series production of the new Nite Coach was underway. As Pacific Greyhound had already committed to purchasing the new coach, Wren likely purchased the necessary tooling from Pickwick's receiver and completed the remaining Nite Coach's construction in the new Columbia Coach Works facility. Both Columbia Pacific Nite Coach Lines and Columbia Coach Works were named in recognition of the Columbia Finance Co., a newly formed holding company controlled by Wren that held a controlling stake in both firms. Dwight E. Austin did not join Wren in the Columbia enterprise, electing instead to produce his own 21-passenger city transit bus, the Austin Utility Coach, in Pickwick’s former Mines Field factory which he leased from Pickwick's receiver, C.A. Sheedy. What is known is that at least eighteen of the bread-box-style Nite Coaches were constructed. Ten were purchased by the Pacific Greyhound Line while the remaining eight coaches were sold to the Wren's Columbia Pacific Nite Coach Line. Whether they were constructed by Pickwick Motor Coach Works or by Columbia Coach Works remains unclear. At least one photograph gives a late 1932 date, although most state 1933 or later. Pictures exist of the coach in four liveries, Columbia Pacific Nite Coach Lines, Pacific Greyhound Line, Sante Fe Trail System Nite Coach and Santa Fe Trailways Sleeper Coach. Columbia Pacific went bankrupt in 1935 and the route was taken over by the Burlington Line. The new owners elected to replace the two-year-old coaches with more cost-effective units so they were sold to the recently established Sante Fe Trailways Stage Line, who refurbished them for use on its daily Kansas City to Los Angles run. Columbia's story is continued in greater detail on the Columbia Coach Works page. Bus collector Eric McLain is the last recorded owner of the only Pickwick coach known to exist, a 1930 Duplex. 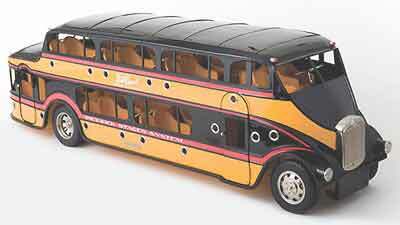 Luckily a number of firms produced scale models based on the Nite Coach that are occasionally offered for sale. During the early thirties the Kenton Lock Mfg. Co. of Kenton Ohio produced a series of cast metal Pickwick miniatures in five sizes 6 in., 7½ in., 9 in., 11 in., and 14 in. Depending on condition the Kentons can be found from as little as $100 to over $5,000 for a large coach in mint condition. 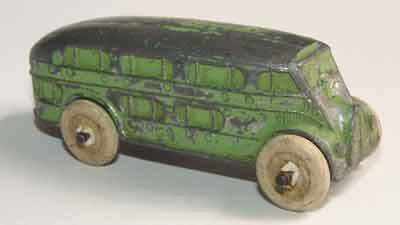 Hubley also manufactured a less detailed series of slushcast Nite Coaches, 2 ½ in., 3½ in, and 4½ in. long. The 3½ in. version featured the fastback Nite Coach, the other two the stepped roof coach. More common and not as desirable as the more detailed Kentons, their prices range between $50 and $400. 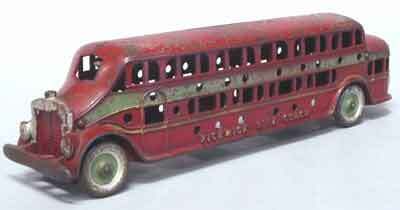 Kansas Toy & Novelty Company, a lesser known firm also produced 2 Pickwick Nite Coaches, a stepped roof coach (#49),2 3/8 in. long and a fastback coach (#59) 3 3/8 in. long. Prices are similar to the Hubleys ranging from $50 to $300. 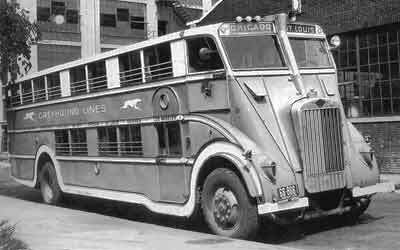 A 27” version of the fastback Nite Coach was also produced in blue and grey Greyhound livery. The painted cast aluminum model includes a detailed interior sleeper cabins with realistically sized cast aluminum wheels. Greyhound logos did not appear on the coach which was lettered Pickwick ‘Night Coach’ Compartment Sleeper. This very rare toy has recently sold for as high as $22,000 in mint condition. Coaches in poor condition can be found for as little as $1,500. Luckily a modern Woodstock, Illinois toy company, Retro 123, manufactures a 32 in. long version of the first Nite Coach, the stepped roofed Alsacia. 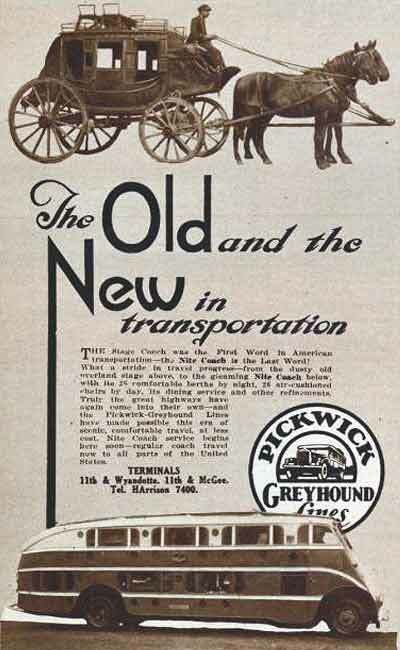 Originally available in Pickwick livery, only the Greyhound version remains in stock as of this writing. A bargain at $895. CLICK HERE TO ORDER.